Higher quality, higher performance, lower fuel consumption and lower emissions - the increasingly demanding requirements for modern motor vehicles create enormous challenges for the manufacturers. The answer to these challenges begins already in the engineering: Vehicle development has to keep up with ever shorter product and model cycles. At the same time, it cannot sacrifice reliability and has to remain cost-efficient. This is where testing technology comes in: it has to provide the engineers with increasingly precise and also new readings. 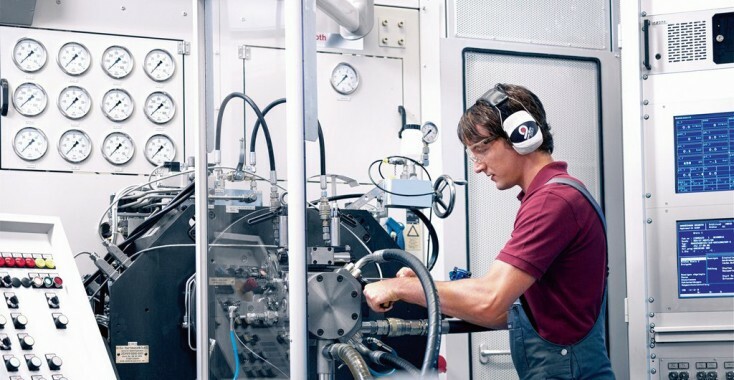 Bosch Rexroth recognized the requirements of this industry. We offer you customized technologies to solve your testing tasks. The equipment developed by Bosch Rexroth for testing the service-life of vehicles is modular: The use of sub-assemblies combined with intelligent design allows for individualized concepts. These concepts can be integrated into the respective testing equipment in the form of self-contained all-in-one systems. For you as a manufacturer, functional tests and service life tests serve as proof of quality. With the help of test rigs, hydraulic components - especially in motor vehicle construction - can be tested for function and service life. This allows to detect and eliminate weaknesses early on. In typical test centers of automakers and manufacturers of original vehicle components a whole series of components of servo-hydraulic consumers in various test and simulation facilities must be supplied with compressed air. For this purpose, it is highly advantageous to install a central hydraulic power unit with programmable controller to control the pressure supply. It comprises in-house installation of a pressure, tank and leakage line, the shut-off valves and monitoring sensors. In many industry sectors, such as in the renewable energies industry, significantly shortening development times and clearance procedures is crucial in order to remain competitive. One option is to implement suitable test procedures, along with test facilities tailored thereto, allowing for proof of compliance with the properties required by the certification bodies for new developments within a short period of time. As a customers of Bosch Rexroth you can access our experts and our service around the globe. With a presence in over 80 countries and experienced specialists form numerous industries we are an ideal partner.